The GTA saw a strong increase in the demand for homes in 2015. Home sales were up every month this year when compared to 2014 with annual sales up 9% so far this year. 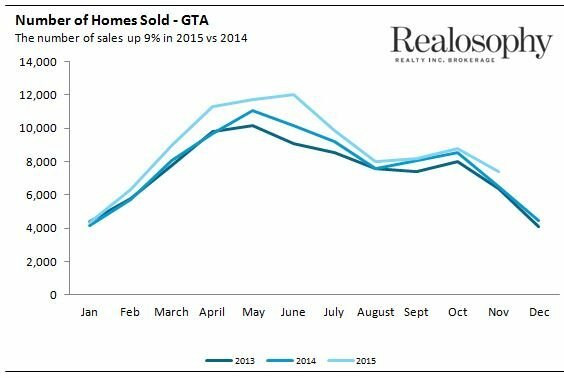 As of November the GTA had a record 96,901 home sales – beating the previous record in 2007 when 95,223 homes sold. With one month left to go expect to see Toronto home sales break the 100,000 mark in 2015. We continue to see one over arching trend in Toronto’s housing market – the supply of homes coming on the market for sale is not keeping up with demand. 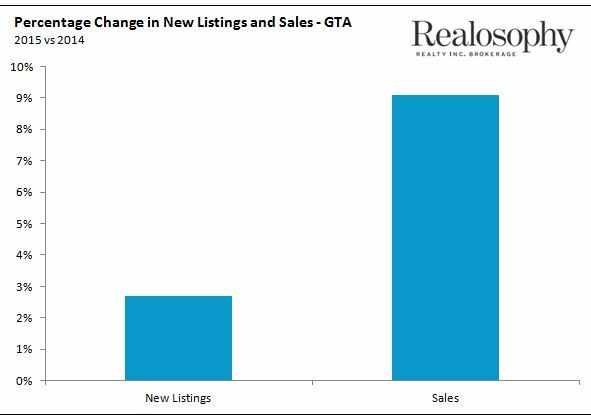 Toronto saw the number of new listings (homes for sale) increase by just 2.7% this year while the number of sales was up by just over 9%. The fact that more buyers are competing for fewer houses is what’s driving the 10% increase in house prices in 2015. The chart below shows the inventory of homes available for sale each month for the past three years. Every month this year we’ve seen fewer houses available for sale when compared to the previous two years. When trying to rationalize the steep increase in Toronto house prices, the press and most real estate commentators typically focus on the strong demand for houses which is in part driven by the high number of people moving to Toronto every year. While demand is of course a major factor behind Toronto’s housing market, we see much less discussion about the impact the lack of supply is having on the market. If Toronto was building enough houses to keep up with demand, house prices would not be increasing 10% per year. In a recent New York Times op-ed, Nobel Prize winning economist Paul Krugman writes that the main culprit behind soaring house prices in New York is not high demand but the land use restrictions that are restricting the supply of housing. A similar argument can be made for Toronto’s housing market. 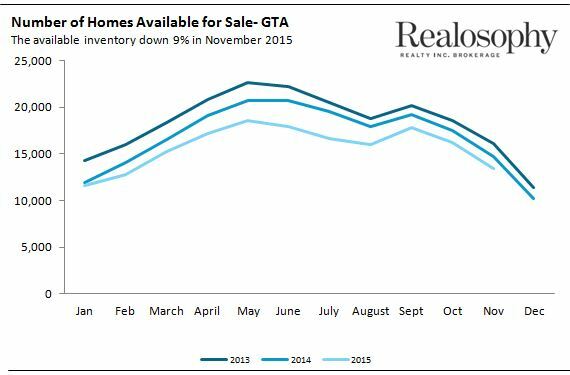 Hopefully we’ll begin to see more discussion about the supply side of Toronto’s real estate market in 2016. When we look at the change in new listings and sales in 2015 by house type we see a very interesting story. To start, we see that the biggest imbalance between supply and demand was with detached houses where sales were up just over 8% in 2015 with virtually no increase in the number of new listings. 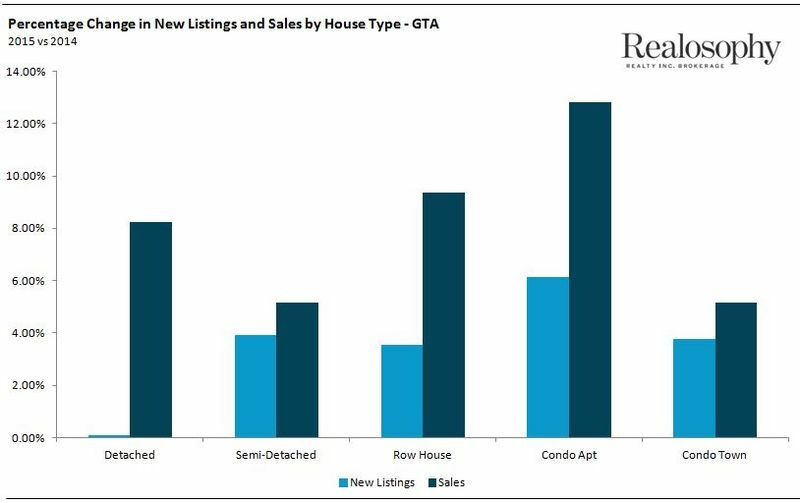 We also see that condos showed the steepest increase in demand of the five main house types. Condo sales were up by 13% in 2015 while new listings increased by 6%. While at first glance with sales up more than twice as much as new listings it might appear as though there was a shortage of condos coming on the market in 2015. This is not the case. When we look at the absolute numbers both sales and new listings were up by just over 2,600 units which means that all of the increase in supply was absorbed. More condos get listed for sale than actually sell which is why the percentage change for new listings is lower even though both saw a similar absolute increase. This is positive news for Toronto’s condo market. Most of the negative press about Toronto’s housing market has centered on the condo market which many commentators have feared is overbuilt. When we look at the number of units coming on the market for sale relative to the increase in demand in 2015 Toronto’s condo market looked relatively well balanced. Earlier this month the federal government changed the mortgage rules for insured mortgages (buyers with less than a 20% down payment) by introducing a tiered down payment system which increases the down payment requirement from 5% to 10% for any portion of a home’s price above $500K. The last time the federal government changed mortgage rules was in 2012 and at that time we saw a significant decline in sales for the twelve months following the rule changes. There were two big changes to the mortgage rules that put many buyers home search on hold. The maximum amortization allowed for insured mortgages was decreased from 30 years to 25 years which effectively cut a buyer’s home buying budget by roughly 10% over night. A couple that could afford a $560K home with a 30 year mortgage in June 2012 could only spend $500K with a 25 year mortgage in July 2012. The other major rule change was that a minimum 20% down payment would be required for homes priced over $1M. Before this change buyers could buy a $1M+ home with just 5% down. The chart below shows the year over year change in sales for each month over the past three years. 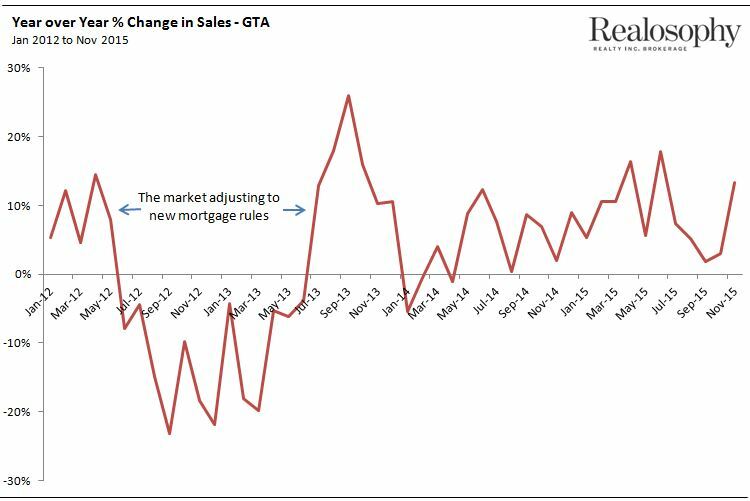 Note the decline in sales from June 2012 to July 2013 – the twelve months directly after the mortgage rules were introduced. I do not expect the most recent changes to have a similar impact on the demand for homes in 2016. The most recent changes impact a far smaller segment of the market – buyers who are planning to spend between $500K - $999K and who only have a 5% down payment.